Blame it on Jeff Fisher or don’t, but the 2016 Los Angeles Rams were pretty miserable. They finished 4-12. They scored 224 points, worst in the league by 40. And, most germane for our purposes, they put up a league-low 741 offensive fantasy points (production from the offensive positions — no kicker or defense). Last year, things improved. They went 11-5 and made the playoffs. They led the league with 478 points. And, again for our purposes, they put up 1,119 fantasy points. It didn’t lead the league, but it represented a 51.0-percent increase on their 2016 total. The Carolina Panthers of 2010 and 2011 have put up the best year-over-year increase in fantasy production since 2006 (and boy, was it No. 1 by a wide margin — the 2011 Cam Newton Panthers put up 80.8 percent more fantasy points than the 2010 Jimmy Clausen team). 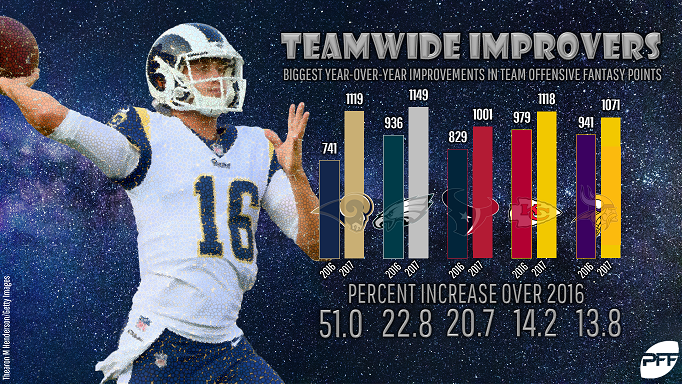 Prior to last year’s Rams team, 25 teams since 2006 have seen their fantasy point total increase by 30-plus percent from one year to the next, averaging a 36.9-percent increase. And on average, those teams fell off by 10 percent the next year. If you’ll allow me one exception to the rule, it’s more significant. The Broncos brought in Peyton Manning in 2012 and he raised their fantasy production (over Tim Tebow and company) 41.8 percent. A second year with the team, and they continued to rise another 27.3 percent. Considering he was a Hall of Fame quarterback coming off injury joining a team that had previously been using a guy who washed out of the league essentially immediately afterward, I’m comfortable saying those Broncos are a reasonable exception. Take those Broncos out of the equation, and the remaining 24 teams have risen by 36.7 percent, then fallen the next year by 11.5. It’s a simple truth that exceptional performances rarely repeat, and the more extreme something is once, the more likely it fades back to the norm the next. That’s true on the individual level, and it’s true on the team level as well. It’s predictable, too. Below is a chart of every team 2006-2017, sorted by first- to second-year change in fantasy production, showing how those teams did in their third year. It’s almost universal. A team that rises by a lot then falls by a lot, and vice versa. This and next week, I’ll be looking at the teams that saw the widest swings in fantasy production from 2016 to 2017. Next week, I’ll look at the biggest teamwide fallers. Below, it’s the biggest risers — also known as the teams that are most likely to put up fewer fantasy points in 2018. Sean McVay (and not being Jeff Fisher) gets a load of the credit for the Rams’ jump last year. Todd Gurley saw his fantasy total more than double, from 155 points to 318, in large part because the team gave him almost a full yard extra to run before contact (1.0 in 2016 to 1.9 in 2017). A wide receiver corps that was Kenny Britt and the Pips in 2016 was rejuvenated, bringing in Robert Woods and Sammy Watkins from Buffalo and drafting Cooper Kupp. And Jared Goff went from potential draft bust to fantasy-relevant quarterback, averaging 9.3 fantasy points per game in 2016 to 17.9 in 2017. Why the Rams could fall off: Health is the first spot. Other than Week 17, when the team sat almost all of its regulars, the Rams were insanely healthy in 2017. The offensive line combined to miss zero games, and Gurley, Kupp, Watkins, and Goff did the same. Of the relevant players, only Woods missed injury time, sitting out three games in the middle of the season. Ding them even a little on the injury side and the Rams will fall off. And even if he and the line all remain healthy, Gurley is due for regression for the simple fact that running backs who finish No. 1 essentially never repeat that sort of performance. Even if Brandin Cooks is an upgrade on what Watkins put up as a Ram, and even if Tyler Higbee and/or Gerald Everett make strides to give the team a fantasy-relevant tight end, and even if Goff’s strides as a sophomore are for real, Gurley and/or health should be more than enough to keep the team from equaling its 2017 performance. En route to a Super Bowl title, the Eagles put up the third-most points in the league. Aside from Zach Ertz — who finished as the No. 3 fantasy tight end — and Carson Wentz — who might have finished as the No. 1 fantasy quarterback if he hadn’t missed three games to injury — the team didn’t have any dominant fantasy players. Alshon Jeffery and Nelson Agholor each finished as low-end WR2s, while the team’s best running back finisher was LeGarrette Blount, as RB37. Even if you just look at Jay Ajayi’s time in Philadelphia, he was the No. 30 RB from Week 9 to Week 16. Why the Eagles could fall off: It starts at quarterback. Reports are positive that Wentz will be healthy and ready to go from Week 1, but if he isn’t, the team will be relying on Nick Foles at quarterback, and whatever Foles did to finish 2017, you can’t expect him to be top-flight-fantasy-QB good. And if Wentz is back, he had the second-highest percentage of passes end in a touchdown a year ago and the eighth-lowest rate of interceptions. Even if he is the MVP-caliber quarterback his results looked like for parts of 2017, those numbers should regress. After two years of maybe-he-shouldn’t-be-in-the-league performance to start his career, Agholor took a big leap in 2017, and in the point I’ll keep making, big leaps in one direction are usually followed by steps back the way you came. The Texans never had a score in the 20s last year. They topped 30 points six times (including a 51-point outing against Tennessee in Week 4 and had 20 or fewer 10 (including 6 or 7 points four different times). And it’s easy (and obvious) to break the scores down by Deshaun Watson time. From Week 3 to Week 8, the Texans averaged 39 points a game. The rest of the season, that average was 13. In other words, when Watson was starting and “good,” the Houston offense was three times as productive as it was the rest of the year. And while DeAndre Hopkins was productive no matter who was throwing the ball, Will Fuller, Lamar Miller, and the rest of the team’s fantasy options struggled after Watson tore his ACL. But after a 2016 with Brock Osweiler and Tom Savage throwing the ball, even that small stretch of Watson’s dominance in 2017 was enough to buoy the whole unit. Why the Texans could fall off: The offensive line. The Houston line is likely the worst in the league entering the season. Watson is electric, but he’ll have to be behind that unit. On top of that, Watson’s results in 2017 were screaming for regression on both sides — 13 percent of his pass attempts ended in either a touchdown (9.3 percent) or an interception (3.9), the highest and second-highest, respectively, rate in the league. The interceptions should level off, but the touchdowns are even more likely to do so. Watson and Fuller played four games together. In that time, Fuller had seven touchdowns on only 22 targets, a success rate that is virtually unprecedented. From Week 2 to Week 8, Fuller’s seven touchdowns paced the league, while 124 different players had more targets than Fuller’s 22. He was the No. 6 wide receiver in that stretch despite playing in only four of seven possible games. Stop me when I get to something that sounds repeatable. Alex Smith‘s career year. The Chiefs’ 2017 season will be remembered for many things — the breakout of Kareem Hunt, Travis Kelce, and Tyreek Hill cementing themselves as elite fantasy options, yet another playoff disappointment — but Smith’s career year was one of the keys behind all of it. He put up the best passer rating and most fantasy points per game of a long career in 2017 — a career that will continue in 2018 in Washington, as the Chiefs have decided to go with Patrick Mahomes at quarterback going forward. He has all the same weapons Smith did, and also gets Sammy Watkins, signed away from the Rams as a free agent. Why the Chiefs could fall off: It starts with Mahomes. It also likely ends there. The simple truth is that Mahomes could be a legendary quarterback in his career and the odds would still be against him doing what Smith did last year. His deep-ball numbers (1,344 yards on passes 20-plus yards downfield, 131.4 passer rating) aren’t the highest in the history of PFF tracking, but they’re very close, and seem to be about the outside limit of what a quarterback could reasonably be expected to do. No quarterback would be likely to do that again, let alone a fresh-faced starter like Mahomes. Speaking of career years, Case Keenum went from career backup who might not be around much longer to a guy getting a two-year, $36 million contract with the Broncos entirely on the back of his big 2017 season. Minnesota had two top-16 receivers (after not having anyone in the top 25 the five preceding years), the No. 7 tight end, and Dalvin Cook looked electric before tearing his ACL and was replaced admirably by Latavius Murray and Jerick McKinnon. For 2018, the Vikings lose Keenum and McKinnon, but get a healthy Cook back and have added Kirk Cousins and Kendall Wright. Why the Vikings could fall off: Do we really know how good Cousins is? He’s been a top-five fantasy quarterback each of the last two years, but he was only the No. 19 signal-caller in PFF grades last year. He averaged more than three more dropbacks per game in Washington than Keenum did in Minnesota last year. With Minnesota offensive line grading out much worse as a pass-blocking unit than Washington’s, Cousins could struggle to recreate his big seasons. Adam Thielen, Stefon Diggs, and McKinnon all had career-best years in 2017, while Kyle Rudolph had his second-best years. Maybe they all came of age around the same time, but the safe bet is the team falls just a bit short of its 2017 heights.